For lunch I wanted to make something fairly quick. I also wanted to use my oven. As it can cool off at night. Using the oven helps heat up the house. Or I use my babycakes maker to make these. I will explain how I make them in the oven. Placing it on seventy degrees and everyone is freezing. With my bad leg I can’t have the house freezing. As my leg doesn’t like to work in the cold since I was shot. The landlord is aware the thermostats won’t kick on unless it is set at seventy degrees or higher. As he showed us that when we moved in over three years ago. He also said don’t place it above ninety. Otherwise it will kick off. Back to what I made for lunch . 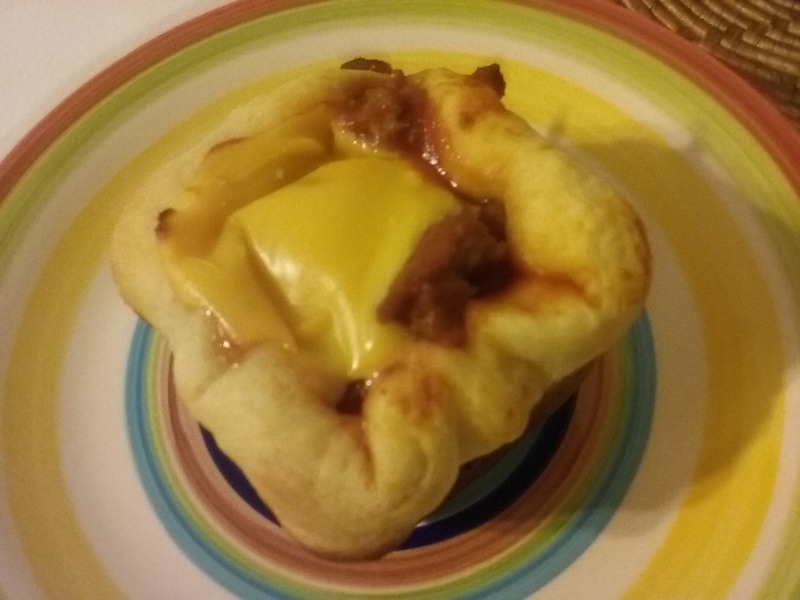 I made a “Cheesy Sloppy Joe Biscuit”. I seen a quick video on Facebook on how to make it. Whenever I see a recipe. I tend to change something to make it my own. 2 pre-made large cans of biscuits, one pound ground turkey, one can of Sloppy Joes mix, and velveeta cheese. I started by frying up the ground turkey. I drained the grease and add the canned Sloppy Joes mix. Set aside. I heated the oven to 350 degrees. I took out the large canned pre-made biscuits. 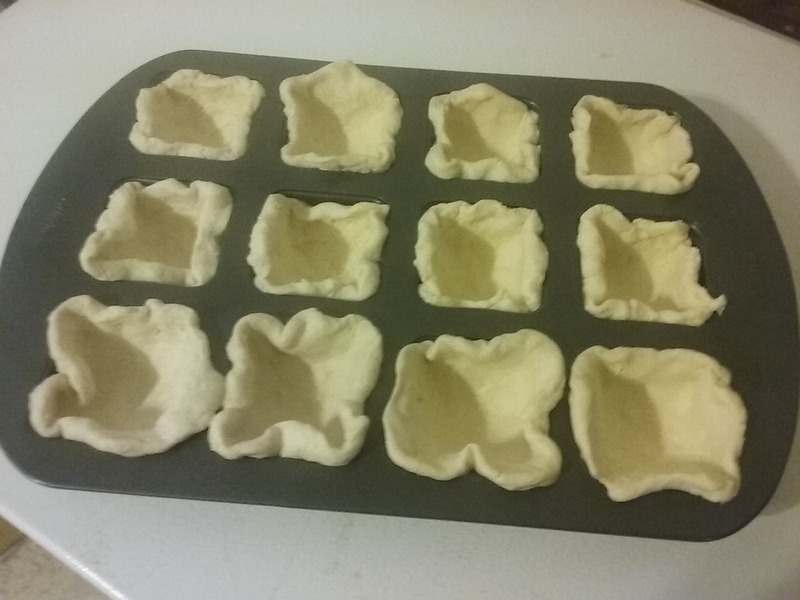 You must use the large biscuit in order for the them to fit in the baking pan right. I opened them up. 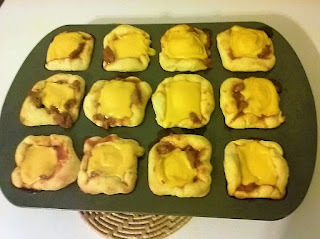 I flatten each one and placed in the pan to use as the crust. I place a heaping scoop of the Sloppy Joes in each biscuit. I topped off with a slice of Velveeta cheese. I baked it for 8 to 10 minutes. It made sixteen. Let cool for about three minutes. Each one came out of the pan easily by using a fork. The sides come out golden brown. I picked up two large canned biscuits at Aldi’s for a $1.00 a piece. The ground turkey was given to us by a local food bank. The canned Sloppy Joes was picked up from Aldi’s for $1.00. I picked up the Velveeta during the holiday season for $4.00. 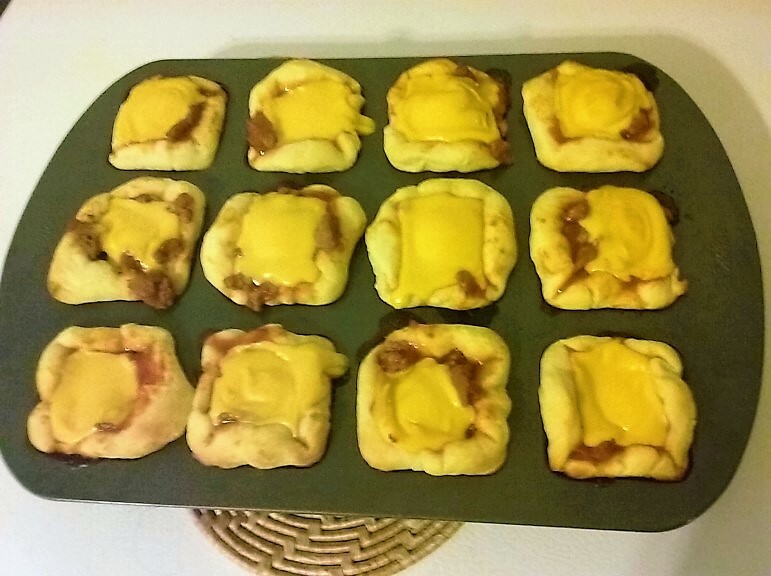 I didn’t use 1/4 of the cheese. I still have plenty to use for other meals. This meal was cheaply made. Which is well within my budget. You can use ground beef or chicken for this to turn out well. One of these biscuits will be enough to fill most people up. As my family found two to be a little much. Quick and easy and inexpensive makes for a great meal and you can't go wrong with your Sloppy Joe sandwiches! Quick and simple to make, a go to meal in my family. these look great! Have made hamburgers like this. I was looking for dinner, I think I found it!